Hello everyone! I hope you all are having a snuggly Christmas Eve. My gift to you this year? How about another installment of my adventure tale? A very Merry Christmas to you all! This is the seventh part of a multi-post series about my time on a Japanese television show. If you haven't read them in order, please do go back to number one. If you're up to date, go for it! So, there I was, back in my hotel room, late at night, after my first Japanese dinner. I had been awake for over twenty four hours, I had flown across the world, and now I had only five hours to sleep before it would be time to get up and catch another flight. Reasonable. I barely managed to get into my pajamas, and send a couple text messages to my family and friends back in the states. Everyone was very excited to hear from me, though a few pictures of my dinner and a text of "So much to tell, but so little time for sleep!" was about all I could manage. Still, as exhausted as I was, I had a fretful night. You would think that with all that provocation I would have slept like a log. Alas, one of my precious hours of sleep time was spent staring at the ceiling of my hotel from midnight to around one. When my alarm went off at three I dragged myself out of bed, took a shower, and made myself as pretty for the cameras as I could. Back in the hotel lobby I met Mine-San, who asked me if I had slept well, then led me outside to where the van waited. Tokyo in the dusk was beautiful. The streets were empty, and a light mist lingered, giving everything a soft tone. Unfortunately, Saori-San wasn't with us yet, so there was minimal talking. My luggage and I were loaded into the van, and away we went. On the way we stopped to pick up George-San, and a new member of the crew, an assistant cameraman, who I would later be introduced to. His name was Chan-San, and I would learn that he was Korean, or at least, from a Korean family. Driving through Tokyo, it started to rain, the silence of the sleepy van was supplemented with the sound of the windshield wipers and the tires rolling across the wet pavement. If I hadn't been so interested in my surroundings, I might have been lulled to sleep. This time, our destination was Haneda Airport, Tokyo's second and smaller airport. Until a few years ago, Haneda mostly did domestic flights, but in recent years, they have opened up to more international flights. I was told that they had done a lot of work to the airport, making it a much nicer place. Unlike Narita, it is inside the actual city, making for a shorter commute from my hotel. As we waited in line, Mine-San handed me my tickets. I looked them over, seeing that we would be flying to Fukuoka, and then to an airport called Goto Fukue. If I had had full use of my phone's internet, I would have googled this, and then I would have known that they had lied to me about our destination. But, as it was, I simple assumed that Goto Fukue was the name of Nagasaki's airport. Not long before we got to security, Saori-San joined us, giving me a little relief to the stress of not understanding anyone. While we walked to our gate, she told me that she doesn't usually do these tv shows, but that a friend of her's had asked her to do this once. She didn't know that I had already been filmed at my house, so while we walked I told her the story, which she found pretty amusing. At the gate, we had about an hour and a half to wait for our flight. There was a Starbucks right next to us, so Saori-San, Youki-San, and I all went over and picked out food and coffees for everyone. I was highly amused by seeing that amongst the packaged sandwiches, scones, and muffins, there were "American Waffles". These plain waffles were wrapped in cello bags and sitting upright on the shelf, like a sandwich. I giggled and took a picture, which attracted Saori-San's attention. I had to explain that this was in no way the method of eating waffles in America. Still, this wasn't really that strange, considering that I would later come across corn on the cob in vacuum-sealed baggies, in a connivence store in Tokyo. While we waited in line, Saori-San and Youki-San talked, and she related some of the information to me. Youki-San was only nineteen, and in high school, he had been a judo champion for Western Japan. He still lived with his parents and his sisters. I never got a definitive number on these sisters, but I ended up with the impression that there were many of them. True cat lovers are clearly distinguishable across language barriers, as later he would show me a series of pictures he took of his family cat. The sandwich that I ended up getting, was probably the best I have ever had, and I am very surprised to discover I didn't take a picture of it. All it was was a chicken sandwich with tomato and pesto, but my god, they got every element just right. The chicken, was a fried katsu style cutlet, and unlike if you had gotten it in America, it was dark meat. I am a chicken snob, so I was gratified to find this. The pesto had good flavor, but it wasn't over powering. It was only half a sandwich, but it was very filling. I also remember this fondly, because it was the last food I would eat for the next couple of days that wouldn't make me feel sick. This is embarrassing to admit, as a food writer. It had nothing to do with the food, which was all delicious and perfectly good. It had everything to do with my slow decent into jet lag caused nausea that would plague me throughout my first days of filming. Pretty soon it was time to board the plane, and while Saori-San and I stood towards the back of the line, she pointed out someone all the way at the front. "See that man in the straw hat?" she asked me. I did. He looked young, wore a sort of boatrace-esque hat, a loose shirt and shorts, and a pair of geta sandals. I sort of think he was holding a ukulele case as well, but I might be embellishing my memory. "That's a famous actor," she said. So, I have no idea who it was, but I did see a Japanese celebrity. On the plane, I sat apart from all of my crew, and instead found myself between two business men. I might have been upset that I wasn't in the window seat, but I was far too distracted by the magazine I found in the pouch. I discovered that you can buy creepily realistic dolls of the airline's flight attendants. There was an extensive article about how they made them, and a number of other dolls. There were also several articles about a festival somewhere in Japan where people dress in spectacular yellow onesies and terrifying masks. I looked through the whole magazine while we sat on the tarmac and took pictures of pretty much every page. Someday, I'll be able to read the text and find out what the heck is happening. Once the plane started rolling around the airstrip, I found another magnificent distraction. The tv screen in the back of the seat in front of me came on, and a film about airplane safety began to play. I have always had an issue with the way that most airlines give their safety instructions, with the flight attendants pointing and miming blowing into their life vests. Not because I think myself above such measures, but because I can never hear them. I don't think I've ever been in an airplane where the pilot wasn't either mumbling, or the speakers weren't crackling like a merry fire and drowning out all of the life saving information. Well, this video covered everything, and in the most amazing way possible. I tried to find this video on the internet, but was unsuccessful. However, I did find a blurb about it on the website of the company that came up with the concept, go figure. Apparently, this was the first in-flight safety video to leave the airplane behind, instead, moving the seats and the passengers into a jazz club. Yes, it was as amazing as it sounds. We learned all about how to inflate our life vests while the actors mimed being in the relaxing atmosphere of the jazz club. Unlike American safety talks, they also covered being respectful to your fellow passengers, which I thought was a nice touch. I am totally kicking myself for not filming it on my phone. Kicking myself though, not the back of a fellow passenger's seat. Now I know how inconsiderate that is. Finally, the plane started to take off, as we picked up speed I happened to glance out of the window. There was a row of about seven or eight men waving at the plane as it passed. At first I thought they were signaling somehow, but then, I noticed the guy on the end was flapping his hand the way little kids do when they're really excited to say goodbye. I'm pretty sure they were just wishing us a bon voyage. The flight itself was uneventful, I spent most of it making notes in my journal. Without these notes I don't think I would have remembered that Mine-San told me she had a pet snail, which she found on a head of cabbage and has been feeding ever since. You're welcome. When we arrived in Fukuoka, I was fascinated to see how big of a city was spreading out under our plane. The airport was also impressively massive. When the plane landed and we started to depart, I realized we weren't at a gate, but were in fact, standing in the middle of the tarmac, very far away from any buildings. I haven't stood around on the tarmac of an airport since I was a child. It felt weird. There were several shuttles waiting to convey passengers and luckily for me, You-San had disembarked before me and was pointing to the right one. I was shortly joined by Saori-San, and took advantage of my English speaking companion to talk about how weird it was to be allowed on the tarmac. "We don't do this in America," I said. "Why not?" she asked in surprise. "Ummmmm...security." The plane that was to take us to our next destination was very small. I felt like Tintin while I walked across the tarmac and up the stairway. Later, Saori-San and Mine-San would both tell me that they were really disconcerted to fly on such a small plane. But, heck, I grew up flying in bush planes, so an airplane that holds thirty was no problem for me. I was especially excited to find myself in a window seat, finally. Not that this did me a whole heck of a lot of good, since it was still overcast. However, I did catch a few glimpses of the ocean below us, and as we got closer to our destination, I saw islands. Now, the ticket and the size of our plane should have tipped me off that we weren't going to the city of Nagasaki. But, what did I know? We were in a totally foreign country, and I didn't really know anything about Nagasaki. However, when I started seeing small islands with farm lands and small towns getting closer and closer as we prepared to land, I became suspicious. When we landed at the worlds smallest airport, I was pretty sure they had tricked me. I got off the plane and found myself on an island with luscious greenery and a number of palm trees. It looked pretty familiar to me, though I couldn't quite put my finger on it. "It looks like the island in Jurassic Park, doesn't it?" said Saori-San. Oh yeah, there you go. I would not have been surprised to see a pack of velociraptors run out of the woods. We walked into the small airport building, and I read a poster that was amazingly in English. "Welcome to Fukue Island". Definitely not Nagasaki then. While we waited for the carousel to bring us our luggage, I made a detour into the ladies room. If you're curious, you face the wall and squat. This was my first experience with a Japanese public bathroom, and I almost had a hear attack when I pushed open the first stall. The toilet, was frankly alarming. It looked like someone had installed the toilet inside the floor, a sort of porcelain troff. I had never seen one of these, in all my research about traveling in Japan. I would later discover that these are traditional Japanese toilets, and make a lot of logistical sense if you're wearing a kimono. Thankfully, there was a "normal" toilet in the second stall. I'm especially glad, because later I saw a diagram of how you're supposed to use these toilets, and I one hundred percent would have used it backwards and peed all over my leg. After my harrowing bathroom experience, I joined the crew and headed for the exit. You-San wanted to film me leaving the airport, so I loitered in the lobby while they prepared on the other side of the automatic doors. There were a lot of red, tropical-looking flower decals stuck to the glass, and all over the walls. I figured they must have some significance on this island, and I was right. Finally, You-San waved at me and I rolled my suitcase through the doorway. It's so weird to think back on this, because it really was only the second time I had been filmed in Japan, but I've already forgotten how weird it felt. While the van was loaded up with all the camera equipment and luggage, You-San beckoned me and Saori-San to follow him and George-San across the parking lot, so he could film me with a better background. With the camera pointed at the two of us he asked me if I knew where we were. "Um, well, there was a sign in there that said Fukue Island," I said. You-San produced a magazine that he had picked up in the lobby. He opened to a particular page and showed me a map of Japan. He pointed to one part. "Tokyo," he said. He moved his finger in an arch over the map, then landed it some distance to the south. "Fukuoka," he said. 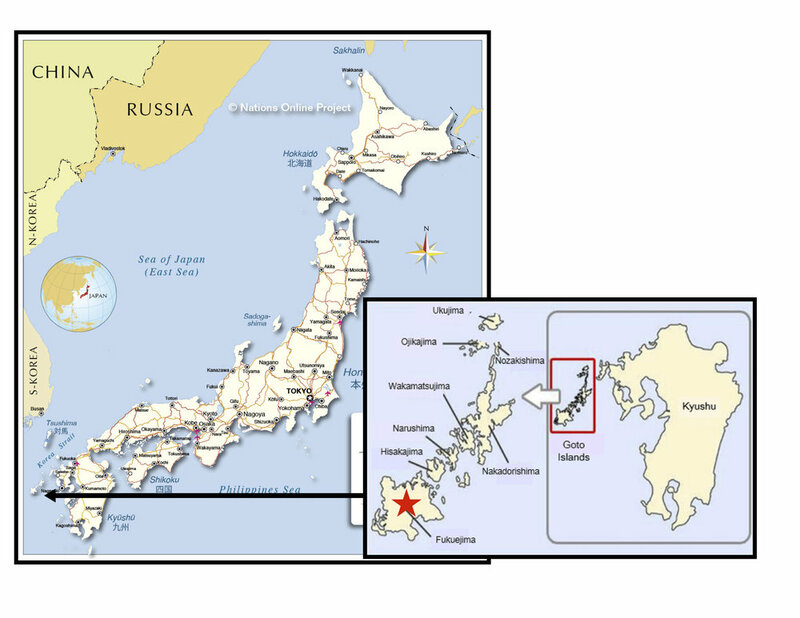 Once again, he moved his finger, this time a shorter distance, to a group of islands off the coast of Kyushu. "Goto," he said. Then he indicated the ground below our feet. "Goto," he said again. "Goto," I repeated. He grinned and pointed out Nagasaki on the map, then pointed back to where we were. They had tricked me indeed. We were not going to Nagasaki, but instead, we were on the Goto Islands. Specifically, the largest island, Fukue. You-San told me that Goto was famous for its kamaboko, and that we would soon be making our way to a family company that made those delicious fish cakes. I was very excited, though also extremely nervous. However, I must bring this installment to a close. I'll write again soon, and tell you all about Goto Island and my first encounter with actual kamaboko masters. If you've enjoyed this post, you might like this one, about the island populated by rabbits. Or maybe this one, about Christmas cake. Heck, you might also like this one about how fried chicken is a Christmas tradition in Japan.